Pagans in Vegas, released on September 18th the band’s career sixth studio album was the first of two albums from Metric to be released within a year, the second album expected in early 2016. The band spent time writing in 2014—Shaw at his studio in Toronto, delving into the CS80 synth and Haines with acoustic instruments in Nicaragua and Spain—and the work yielded an unprecedented amount of material that revealed itself across at least two major musical veins. Realizing they had composed enough music for two very different albums, they decided to let each collection of songs stand on their own. 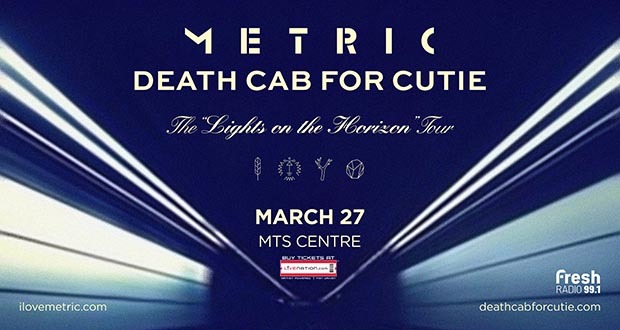 Now fully affirmed as an era-defining band, Death Cab for Cutie made a stunning #1 debut atop the overall album charts in both the U.S. and Canada with 2008’s gold-certified “NARROW STAIRS.” More critical acclaim and two further GRAMMY® nominations followed, including nods for “Best Alternative Album” and “Best Rock Song” (honoring the hit single, “I Will Possess Your Heart”). “THE OPEN DOOR” EP was released in 2009, earning DCfC a third consecutive GRAMMY® Award nomination for “Best Alternative Album.” “CODES AND KEYS” arrived in 2011 and debuted atop Canada’s Alternative Albums chart before receiving the band’s fourth straight GRAMMY® nomination for “Best Alternative Music Album.” “You Are A Tourist,” the album’s first single, also proved a multi-format radio smash. For more news and information, please log on to www.deathcabforcutie.com.